This statistic illustrates the number of employees of the financial services sector in London, the United Kingdom (UK) from 2007 to 2014, with the provisional results for employment as of June 2015. According to the source, a survey of members was conducted on the subject of employment trends in 2014, with companies in the area of financial and professional services with roughly 100,000 employees responding. 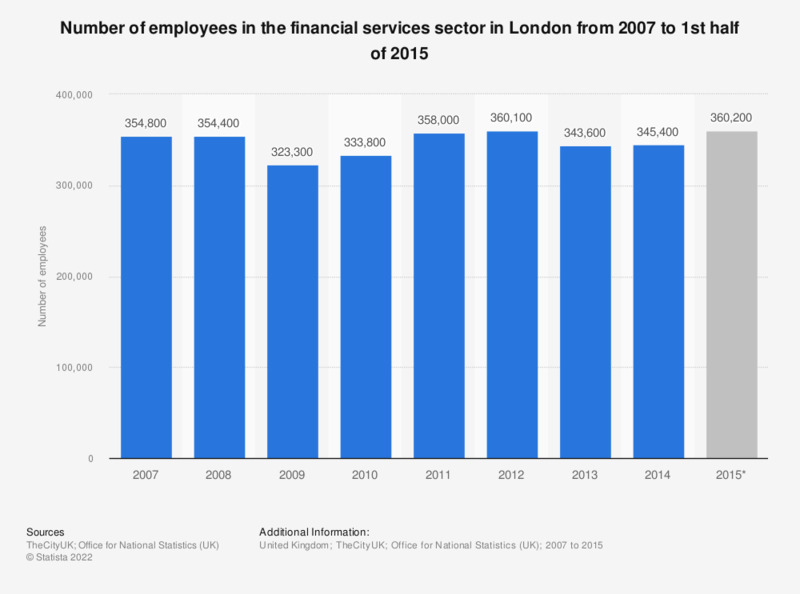 In 2014, there were 345.4 thousand people employed in the financial services sector in London, an overall decrease of 9.4 thousand employees in comparison to 2007. As of June 2015, the provisional figure had increased to a total of more than 360 thousand financial services sector employees in London. This trend in the total number of financial services sector employees in London. It can be seen in the context of a similar trend, displayed for the overall sector. It is reflected in the total number of employees in the financial services sector for the United Kingdom (UK) as a whole. Also interesting is how the number of financial and insurance sector employees in London is forecasted to change in the future. Everything On "Salaries in financial and insurance sectors in the United Kingdom (UK)" in One Document: Edited and Divided into Handy Chapters. Including Detailed References.